Experience Sin City like a high roller (but without the high prices) thanks to the Las Vegas Bite Card, offering deep discounts at a variety of eateries and attractions along the Strip. Save hundreds of dollars off regular price, thanks to special discounts offered at hundreds of Las Vegas restaurants, shows, nightclubs, weddings and tours and attractions covered by the card. Best of all, there are no coupons to redeem (just present your card) and your card is valid for a whole year ensuring plenty of fun. Live it up in Las Vegas without burning a hole through your wallet thanks to the Bite Card, a Vegas discount card offering a wealth of special offers at the city’s top restaurants and attractions. You’ll save hundreds of dollars off regular price when you spend at some of Sin City’s favorite dining, entertainment and nightlife destinations. Save up to 50% on admission to Las Vegas shows, or stop by one of the range of great restaurants covered by the card for special prices on a variety of cuisines. If you’re looking to double the fun, present your Bite Card for discounts on tours and attractions or use it at some of the top Vegas nightspots. Couples can even save $50 on their Las Vegas wedding. For a full list of businesses covered by the card, please refer to the Itinerary section below. Deals are subject to change without notice. 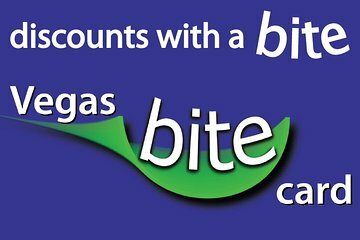 We really enjoyed using our Bite card amd it saved us some $$ that we enjoyed using at the casinos. We used this card in numerous restaurants in Vegas. No problems whatsoever in using the card. It saved us quite a bit of money. Will use it again should we return to Vegas. Very disappointed withnth8svajd I wish I had not bothered to get it. Only 2 places we went took the card and we were nnly able to use it at 1 because twofold the minimum required bill amount. We didn't use it for any of the shows since the hotel was able to get the same deal and print out the confirmation ticket for us. Good if you are going to use it in the relevant places. Could be useful in the hands of anyone who makes the effort to use it.